Well, yesterday was a long day spent working with the brake lines. I started using the kit supplied brake lines, but never could get them to look the way I wanted, so I ended up going in a different direction. I ended up using a roll of NiCop brake line. This stuff is much more bendable and easier to work with, plus I was able to use my professional flare tool that I had bought prior to starting my build. I was able to get the brake lines done. They're not perfect, but I think they'll work. Additionally, I did not use any thread sealant/permatex, loctite or anything on these unions between the brake line and the adapter they fit into. Please let me know if this is needed seeing how I used a different type of brake line. I got my fuel tank installed as well. The next step was to get the fuel filter mounted, which is where I ran into some trouble. I can't seem to get the hose that connects the fuel filter to the fuel tank to cooperate. It's too long and when I try to bend it, it will kink. I saw in EdwardBs thread the hose in question appears to be stainless steel. I'm thinking about making that swap in hopes that it will fit better (and looks better, imo). But if anyone has idea on how to get the filter mounted so that the kit supplied hose will fit..please let me know. Last, anyone know this piece? It was in my E-brake hardware. Last edited by MechanicalKnowledgeNone; 03-31-2019 at 08:38 PM. I started on my brake lines today. A little tougher than I anticipated. I was only able to get the front lines that connect the front PS and DS brakes before I had to go to work. My question for the forum: Is it okay to have the brake lines protruding out like they are OR do I need to re-do them to reflect the red lines so they are more "tucked" into the sides of the engine compartment? None of them are bolted down. I'm waiting for my stainless attachment pieces. Also, I got a my CNC resevoirs delivered today. Been following your blog peripherally. I'm about the same stage as you in my build. I was noticing that you placed your DS to PS brake line in front of the X member. I've seen some other builds with it on the back side of the X member. I was wondering if there's a difference. Also any suggestions on measuring/bending the brake lines? I was thinking of using a string of the same length to determine how much "slack" to have on either end in order to make sure you don't run out of line before getting to the fittings and where to bend the line. BTW, I'm posting my build in the other forum under egchewy. I found it easier when I was first starting to post pics on that forum. I started a build site on this forum but wasn't able to post pics initially and decided that it was too hard to keep updating two forums. For your fuel line, try swapping ends. Put the right angle onto your filter and see if it will fit into place the way you would like. The kit comes with a couple of different a break hook up systems. I can’t “which one that is for. But if you don’t need it on yours then it will go in the box of not used parts. I’m sure somebody will chime in as to what that is specifically for. But I believe it’s for the mustang donor brakes. Thanks for keeping tabs on my build. It's nice to knowing there is someone else out there who's also at my stage of the build. I used the backside of the X-member for two reasons: First, I wanted the brake lines to be in front of the X-member because I thought the X-member might provide some protection against heat as well as any pebbles that might being flying around in the area. Secondly, it's because that's what I saw on EdwardBs, Papa's, Wareaglescott, and Carls build threads. As far as measuring the brake lines, I used clothes hangers. I took two clothes hangers and straightened them out and taped them end-to-end. I bent them all around until I got a general shape and length, then used them as a template for measuring the NiCopp. String probably would've worked better. As far as bending the lines. I used this, https://www.amazon.com/gp/product/B0...?ie=UTF8&psc=1. I definitely could have used a bending tool with a tighter bending radius, but was able to manage with above. I looked at some build threads again and it looks like Wareaglescott did his in front of the X member and Yama did his on the back side. Maybe I'll poll the forum for opinions. That bracket is for the e-brake. Its one of the 2 mount brackets. So it appears my E-brake cables are too long. Did I receive the wrong cables? Or is this common and they just require shortening? Here's the rest of the routing. I think everything else looks good, but the front of the cable where it attaches to the handle is about 15 inches too long. Pat, Perhaps they have changed the design a bit since 2015 when mine was fabricated at FF so this may not make sense. The E-brake cable should be going through a 2 hole mount on the rear cross bar just in front of the Differential on the passengers side. Then the pigtails of the cables would route under the 4" tube and to the ebrake handle. Now, many people, me included, put in a pulley modification so that the cable did not go under the 4" tube but over it and under a pulley that we installed along with a bracket to clamp the cables in and yes, we had to shorten them a bit. HERE IS A LINK to EdwardB great write up on the modification if you want to check it out. It really is a much cleaner install. Hope that this and the link provided helps.... Later when you get to working on the carpet and interior, here is a Link to how I sealed up the large hole that is along with the e-brake handle.... It may help as well. Here is a photo of mine after the modification. BTW you are moving right along and things look really nice... great job!!! I'm using Ford parts for the rear brakes, but it details how I did the pulley mod. I'm still working on the E-brake situation. I found the mounting bracket with two holes to run the E-brake cable through and it appears the issue with the cables being too long fixed itself. I also assembled my E-brake handle and got it installed. The only issue is when I crank the E-brake handle, there is still a little too much slack in line and the E-brake caliper doesn't move. I'm assuming I'm going to have to tighten the cable somehow, which will most likely come from shortening the cable. The only issue I have with shortening the cable is how to re-attach the little metal stopper on the end of the cable. Any thoughts? Secondly, I was messing around with the E-brake caliper and I manually pulled the E-brake cable to see what action happens with the caliper and I noticed that even when I manually pulled the lines, the E-brake caliper still didn't budge. Not sure what to think about that. Any thoughts? Last, I'm starting to look into my Fuel Line situation and had a question for the forum. I'm going to use the In-tank fuel pump. I was reading the supplemental installation instructions on the FF website and it appears they have both the fuel send and return lines being flexible, which I have located. See Pic. The supplemental instructions don't make any mention of the hard lines. The instructions appear to just use these flexible lines to connect the fuel tank to the pressure regulator. So what's the deal with this? Do I HAVE to use the hard lines or can I just use these flex lines? I decided to move on and work on the In-tank fuel pump and ran into another question. It has to do with the wires that attach to the fuel pump. There is a Red wire and Black wire. The issue I'm having has to do with the ends of these wires..they are different. 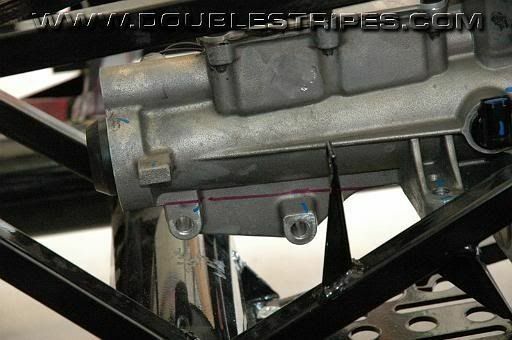 Here is a picture of the prongs on the top of the fuel pump. The end of the Red Wire will fit over the prong and sorta "straddle" the male prong, which feels correct. There was even a little, "click" that made it seem like it was a good fit. However, the end of the Black Wire is smaller and shaped differently. Because of it's size and shape, it does NOT fit on the male prong in the same manner as the Red Wire did. The best I can do is get the end of the Black Wire wedged up against the male prong. Does this look correct? Something just doesn't seem right about the way the Black Wire is connected to that male prong. Last edited by MechanicalKnowledgeNone; 04-02-2019 at 03:01 PM. I have to bow out on your brakes as I'm not familiar with your setup. As far as your electrical connections, the way you have the black wire is INCORRECT. It needs to have a connector that clips over the prong on the pump just as the positive wire did. You may have to cut off the current connector and solder/crimp on a new, correct sized one. Remember, when completed, this is going to be inside your fuel tank. You do not want it coming free while your driving down the road. I can not tell by the photo, but it kinda looks like the negative terminal on your fuel pump is actually a slightly bit thinner (not as wide) than the positive. Are you sure the current connector is not wide enough to be pushed over the terminal? Don't over force it and brake something, just asking so you will give it a second luck before you do the work to replace it. Yeah, do not leave the pump wiring like that. That black could pop loose and run up against the red and then you've got a classic powered short circuit and maybe sparks in your tank. Also, you can use flexible fuel line for the entire run. Safer and more OEM is to run the hard line for most of the length of the car, adapting to flex at the engine and at the tank. Some states may have something to say about all flex line... but maybe not. Have to check on that. What I can’t understand is WHY there two different ends to those wires? It’s little things like this that I just don’t understand. I’ll try to press the end of the black wire over the male prong, but I’m not feeling too confident. I see a call to FF in the near future. So, my progress has slowed significantly over the past week or so. I'm starting to get into the nitty-gritty part of the build, which means I'm getting into even more stuff that I know even less about than before. I'm second and third guessing myself on every little thing, which is really slowing me down. First, I've had the hardest time with the fuel filter issue. I won't bother the forum with my whining, but I suffice it to say, I'm waiting on a hose from Breeze that connect the fuel filter to the fuel pump. Hopefully once that arrives I can get moving again. I also managed to get my fuel pump installed. I'm using the FF in-tank pump, which is a Walbro 255lph. Now, I have zero understanding of pumps, pressure, psi as it pertains to engine performance. None. My engine came with a Holly Sniper EFI, which comes with an In-line fuel pump. I was not really excited about using an In-line pump. The mounting of the pump seemed cumbersome and not pleasing to the eye, so I elected to go with an In-tank pump. I called the folks over at Holly to discuss the choice to use an In-tank pump. The guy on the phone said that using an In-tank pump was perfectly acceptable. I explained to him that I was using a Walbro 255lph and he said that should be fine. However, he did mention that whatever pump I use, it needs to be able to achieve 60psi. Now...when I look on the internet, I can't find a definitive answer as to whether or not the Walbro 255 can achieve the necessary 60psi. Some places say it is fine for high horsepower engine (like mine, 538hp), but other places say it only can achieve like 43psi. Also, as per the recommedation of BadAsp427, I added a length of hose to the end of the fuel return line that is inside the tank in an effort to reduce amount of turbulence the returning fuel causes. I really really hope I don't have to replace my fuel pump with a more powerful one, because I had a heck of a time getting the pump assembly into the tank. Next, I'm contemplating the fuel line issue. Honestly, I know this might not be a popular choice, but I'm leaning toward using the kit supplied flexible lines that go through transmission tunnel. The installation looks very easy and I like the idea of the lines being hidden in the tunnel. So, unless someone can come up with a convincing reason why I should not do this, then I'm going to proceed. Last, I got my CNC double reservoirs installed. I got a piece of 1/4" aluminum from a local metal shop and painted it. I mounted the CNC reservoirs on the aluminum and then mounted them to the frame. It's solid as a rock. Still trying to figure out how I want to run the hoses through the footbox, plus I'm having a hell of a time finding grommets that will work. Ideally, I want a grommet with two holes in it, but I haven't been able to find one. Last, I'm still working through my E-brake cable fiasco. I've ordered a pulley from Mcmaster and will be doing the EdwardBs modification. The only question I have involves the little metal ending of the E-brake cable. It looks as though I'll have to cut this little metal thing off and re-attach it. Can I re-use that little metal thing once I cut it off the cable or do I need to get another one? If so, what are these things called? I also order my tires today: Nitto 555 G2, 255/40's up front and 315/35's out back. So let me start with your question about the fuel line. Regaurdless if you use the hard line or the flex line, the advantage of running the line on the outside of the 4" frame rail vs on the inside of the tunnel is that if anything goes cabluie... that's Bang in gibberish, the fuel line is protected on the outside of the tube where as on the inside it could be damaged and create a fuel induced hazard. Just food for thought. As for the E-brake modification, if you are getting the Locar clevis like the one that I and Paul (EdwardB) used, you have to cut off the metal end anyway. You will not use it as the cable is held in with a set screw. Also, Ace hardware has some really nice pulley wheels for about $7.00 ea if you need to get them. They are actually the wheels for a sliding glass door... Ball bearings and very strong. x2 on what Badasp said. I would not run fuel lines through the tunnel. Regarding the Walbro 255, I'm no pump specialist, but the output will be a variable depending on the regulator. I think some sites test at different pressures, which is why it can be confusing. From what I've read, the Walbro will run up to 80psi on the GSS series (340, 341 and 342) and will support 500+ HP. Not sure which one you have? As for grommets, I was never able to find one with individual holes, and I looked everywhere. Found one with 3 holes, but it would never fit the hoses right. Ended up just drilling my own and grommeting those holes. I wanted to run my E-brake issue past the forum one more time before I go making any more mistakes. I installed a pulley that I got from McMaster. (I'll probably add a second one, so each cable has their own pulley). The question I have for the forum has to do with the union between the cable and the clevis. This first picture you'll see that the clevis is hanging straight down from the E-brake handle. This is currently how the clevis has to be oriented in order for the cable ends to fit into the clevis. However, this orientation will not allow the E-brake to be functional because there is too much slack. If I crank the E-brake handle, it won't pull the cables taught and the E-brake calipers don't engage. Instead, I need the clevis to be parallel to the ground while at rest, so that when the E-brake handle is cranked upward, the cable will be under enough tension to activate the E-brake caliper. In order for that to happen it looks as though I have to shorten the cable about 2cm or so. In the picture, I'm holding the clevis parallel to the ground (which is how I need it to be when the E-brake handle is down) and you can see how much extra cable there is. It seems I would have to cut off the metal button end, shorten he wire and then re-connect the metal button end. Does this seem correct? In-tank fuel pump pressure - I'm also using the supplied in-tank pump, but the "Corvette" internally regulated filter setup (from Forte's) on a Coyote. Our systems are apples & oranges, but for peace of mind my fuel pressure is 58psi at the fuel rail/point of use. Fuel Lines - Do not run them down the tunnel. The chance of a U-joint or driveshaft failure (shrapnel) is MUCH greater than the car getting whacked hard enough to reach a main tube mounted line. E-Brake Cables - You can snip the cables and install a new crimp fitting on the end... **Warning** It does take a specialized crimping tool to properly put these on! If there's a "chain & rigging" supply house nearby they will probably do it for you for a small fee, but you have to bring them the whole cable assembly. I would purchase the Lokar clamping piece and be done with it. I ran my fuel lines today. I listened to the forum braintrust and used the hard lines and ran them down the 4" tube. It's not perfect, but I think it'll work. Pictures are a little dark as it was the end of the day. So today I divided my time equally between the garage and the living room to watch The Masters. I managed to get some stuff done. I mounted my fuel regulator and hoses to the hard lines. I took the AN fittings off the flexible fuel lines and used them for connectors. I then cut the flexible fuel hoses and used those pieces to link the regulator to the hard lines. I hope I don't need those flexible fuel lines for anything, because they're basically carcasses at this point. I made a few rookie moves today, which is evident by the extra holes you see in the firewall, which were drilled and then I realized they wouldn't work, so now I have those eyesores to look at. I'm gonna find some sort of metal filler and try to make them go away. Then I decided I needed a morale boost, so I decided to put some shoes on the car just to see what they looked like. This put a nice smile on my face. I also got my package from Breeze, which was a fuel hose to connect the fuel send line to the filter. I had the hardest time with this step, but the hose from Breeze worked liked a charm, plus it has extra length which allowed for a loop in the hose, which I've been told is good in case you ever have to lower the tank. I'm not thrilled with the connections looking a little different between the send and return lines, but it'll work for now. I might address this discrepancy later. I also worked on my CNC brake reservoir. I switched out the screws that hold the reservoirs to the bracket so the colors match. Plus I managed to get the hoses through DS footbox. I found some grommets, but had to drill the hole in the grommet a little bigger in order for the hose to go through. Drilling a rubber grommet was a little dicey, but I still have my fingers. The grommets are a little messy, but I'm going to somehow clean them up. Not sure how, but I'm sure something will come to me. Tomorrow, I'm going to start the part of the build that I've been fearing since before the build even started. I'm gonna start on the electrical. You wanna talk about a complete absence of knowledge.... I know nothing about electrical work. Zero. Nada. Ziltch. Goose Egg. So I'm gonna be going slow and hopefully avoid making any mistake or electrocuting myself. I'm also going to start assembling the dashboard. Last edited by MechanicalKnowledgeNone; 04-13-2019 at 07:45 PM. Hey Pat, all is looking good. As for the couple of holes that you did in error, one way to fill them is with a nice looking chrome / black / silver (your choice) head bolt. Something 1/4" long that will just hold a nut on the inside. It will look like it is suppose to be there. Another thought is that you just discovered a great place for your metal identification plate.... just a thought. Electrical can be initially daunting, but as you get into it and follow the wiring diagram in the Ron Francis Manual, it will begin to come together for you. Reach out to me if needed, glad to help. Patrick, Looks like you're making good progress. You mentioned that you have a Holley Sniper EFI. I have the 550-510K Sniper which has its own built in fuel pressure regulator. Not sure which Sniper you have but you may not need the external fuel pressure regulator. X2 - I believe all the Sniper EFIs have an internal (60 PSI) regulator. You'll want to be certain before plumbing up the fuel connections or your two regulators will be fighting each other. Again, it comes in a bunch of different diameters, so you may want a couple of different sizes. Lastly, consider Weatherpack connectors for the light connections (headlight, marker, signal, and brake). So, I had intentions of mocking up my wiring harnesses today, but decided instead to re-do my brake lines. I just wasn't completely happy with the way they looked, so I got another roll of NiCopp line and started over. It's amazing how much faster I was able to get this done the second time. Although the pictures might not look drastically different, I can assure you that up close the lines look much cleaner. I just knew I would always be annoyed if I had not fixed them, so I'm very happy I re-did them. Next, a big thank you to the forum and a big palm-to-my-forehead with respect to the fuel regulator issue. I have confirmed that my Holley Sniper already has a fuel regulator, so there is no need for the one that I spent all day mounting. So, I removed the fuel regulator. I then started on my wiring harness. I was able to get the fuse box mounted, ground wire drilled into the frame, brake and clutch safety wires connected. I also drilled a couple holes in the firewall using a hole saw and got some of the wires to go through. Thats all I had in me for the day. Last, I just wanted to double check with the forum that I am supposed to cut this mounting flange off of my TKO-600? Last edited by MechanicalKnowledgeNone; 04-15-2019 at 04:05 AM. Thank you for your recommendations. I'll likely be taking you up on all of those suggestions. I've been reading your thread (among others) as a huge source of information, so I appreciate the detail of your build. Roger that. No special tool required. Pretty simple with a hack saw and a file to clean it up.